View Poll Results: Who will have the most snow for March 2017? Bernie is saying the High Pressure is going to be over New England which is why he doesn't think Boston or Hartford get snow but what if that high trends north now? I also didn't know about the "nothing happens with a cold air injection" thing. I don't buy that. You need that injection for snow but I think he meant its too strong and will stay south of the injection. I figured it was way out there. Here is where our snowstorm is. Circled. And taking that path. 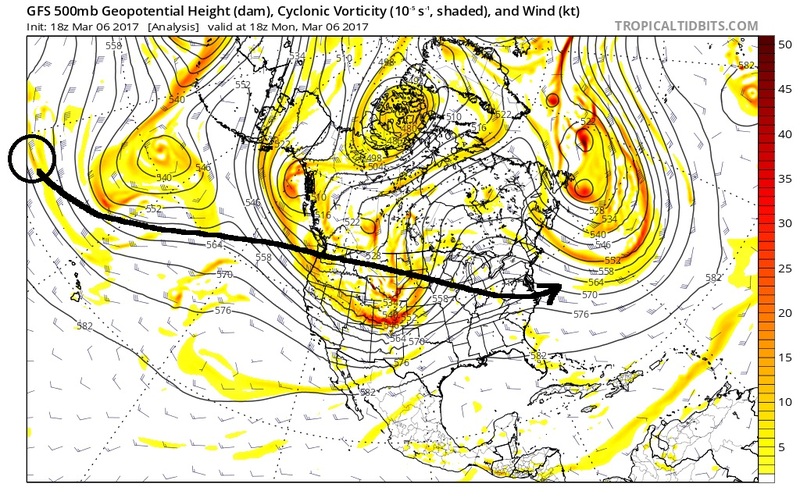 Its just a piece of energy right now not technically a "storm" until it blends with the Polar Jet stream over the U.S. Impressive how models pick these things up so far out! UK model which has performed well this winter, agrees with him and keeps the system very suppressed and strung out. With the cold air injection thing he means the system has to be ahead of the front I believe ?? Otherwise it only gets suppressed. Considering how far out the system is I have my doubts now in the models ability to correctly get this one till 3 days out at least. I will be in DC Saturday, Boston and Albany Sunday, and New York City/Long Island Sunday night through the week. Hopefully I at least get some snow somewhere. Historically March is a big month for snow in New York. Over 10" fell, that I am aware of, March 26, 1956, 14.2" on March 2 or 3, 1960 (I actually remember that storm), Easter Sunday 1970, the Blizzard of 1888, the "Storm of the Century" in 1993, and, in April, on April 7, 1982. I assume you mean Downstate New York. Upstate, especially near the Great Lakes and in the Adirondacks, can get big snow all winter long. Not sure what the records say but March can be a big month for snow on Long Island. The ocean has finally cooled down enough, unlike in the late fall where in Nov/Dec you will see snow inland but rain on Long Island because of the warmth of the ocean. I remember some boring winter seasons (little or no snow) that were saved by a nice March snowstorm. Is this some joke?? Has Raleigh and VA not suffered enough???? Yesterday my forecasts showed 70s for the weekend now 50s on one station and 42/28 on another.... wth. Poor Nei I don't even think he has a chance now. I still have a chance if it shifts north. Snow for WV, Northern VA, Philly, NYC, but not Nei. Light snows. 1-3". Not a lot of moisture with this one. Now.... watch the Euro for the 2nd storm..... 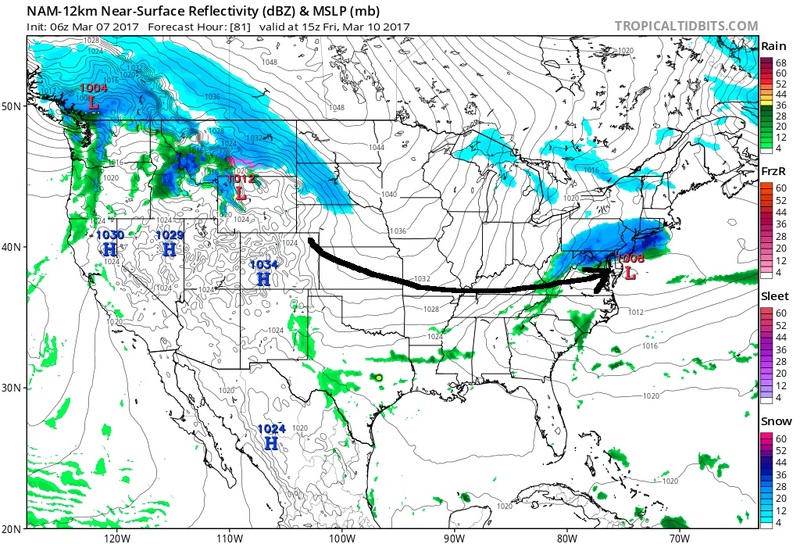 The thicker blue line labeled "130" on it is the rain snow line. Anyone north of that line is snow. Notice how the Euro digs the Jet stream way south! Kentucky gets a snowstorm and not even Philly with this run. Why wont the trend south stop now?? Polar Vortex too strong, too far south?